Hazem Beltagui, Boom Jinx & Maor Levi Ft Ashley Tomberlin, Cosmic Gate, Doney & Nerutto, Oldfix and more. Trance All Access is a 2 hour weekly radio show which airs every Friday worldwide, via the Trance Family Belgium network. 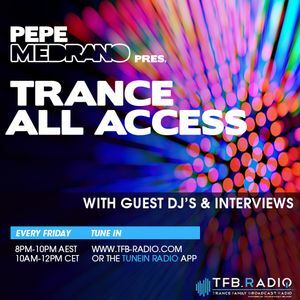 Tune into your host Pepe Medrano, as he warms you up for the weekend with a variety of Trance and Progressive from the past to the present, with a glimpse into the future. Feel free to COMMENT with your track links as local work is always encouraged on the show. Times in the "()" are the hours of the show during the event of Daylight Savings. The app is available on both Android and Apple stores.